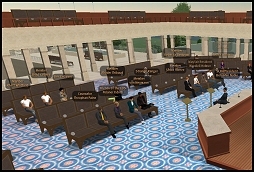 SLBA Press Release – The Second Life Bar Association (SLBA), an informal professional association for attorneys and legal scholars in the virtual world of Second Life, recently concluded its first-ever elections. The SLBA’s new President-Elect is U.K. lawyer David Naylor. Naylor participates in Second Life as the avatar ‘Solomon Cortes,’ and is a partner at European firm Field Fisher Waterhouse (FFW). He led his firm’s project to establish a FFW office in Second Life earlier this year. He will take over as President February 1, 2008, when SLBA Founder and current President Benjamin Duranske’s term expires. The new Vice President of Finance is attorney Geri Kahn (‘Geri Kuhn’ in Second Life). Kahn is an immigration and Social Security disability attorney practicing in California. The new Vice President of Communications is ‘Henri DeCuir.’ In real life, ‘DeCuir’ is a law student at the University of California, Berkeley, and has a background in computer science. The two Vice Presidents will assume their new roles immediately. The new SLBA Executive Board will consist of ‘Cat Galileo,’ an attorney and law librarian in both real life and Second Life, ‘Jessica Holyoke,’ a recent law school graduate, and ‘Theophan Paine,’ an attorney in private practice in New York. Like the Vice Presidents, the Executive Board members assume their new roles immediately. The SLBA currently has over 160 members, and regularly holds meetings, lectures, and social events in the virtual world of Second Life. I am new brand at SLBA so I had not the chance to vote this time , anyway I’d like to congratulate with new elected and give them best wishes of good work .